One of the best-known and most-respected Zen masters in the world today, poet, and peace and human rights activist, Thich Nhat Hanh (called Thây by his students) has led an extraordinary life. Born in central Vietnam in 1926, he joined the monkhood at the age of 16. The Vietnam War confronted the monasteries with the question of whether to adhere to the contemplative life and remain meditating inside them or to help the villagers out in the world who were suffering under the bombings and other devastations of the war. 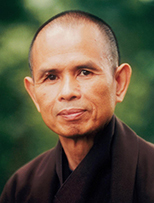 Nhat Hanh was one of those who chose to do both, helping to found the "engaged Buddhism" movement. His life has since been dedicated to the work of inner transformation for the benefit of individuals and society. In Saigon in the early '60s, Nhat Hanh founded the School of Youth Social Service (SYSS), a grassroots relief organization that rebuilt bombed villages, set up schools and medical centers, resettled homeless families, and organized agricultural cooperatives. Rallying some 10,000 student volunteers, the SYSS based its work on the Buddhist principles of nonviolence and compassionate action. Despite government denunciation of his activity, Nhat Hanh also founded a Buddhist university, a publishing house, and an influential peace activist magazine in Vietnam. After visiting the United States and Europe in 1966 on a peace mission, he was banned from returning to Vietnam. On subsequent travels to the United States, he made the case for peace to federal and Pentagon officials, including Robert McNamara. He may have changed the course of U.S. history when he persuaded Martin Luther King Jr. to oppose the Vietnam War publicly, and so helped to galvanize the peace movement. The following year, Dr. King nominated him for the Nobel Peace Prize. Subsequently, Nhat Hanh led the Buddhist delegation to the Paris Peace Talks. In 1982 he founded Plum Village, a Buddhist community in exile in France, where he continues his work to alleviate suffering of refugees, boat people, political prisoners, and hungry families in Vietnam and throughout the Third World. He has also received recognition for his work with Vietnam veterans, meditation retreats, and his prolific writings on meditation, mindfulness, and peace. He has published some 85 titles of accessible poems, prose, and prayers, with more than 40 works available in English, including the bestselling Call Me by My True Names; Peace Is Every Step; Being Peace; Touching Peace; Living Buddha, Living Christ; Teachings on Love; The Path of Emancipation; and Anger. In September 2001, just a few days after the terrorist attacks on the World Trade Center, he addressed the issues of nonviolence and forgiveness in a memorable speech at Riverside Church in New York City. In September 2003, he addressed members of the U.S. Congress, leading them through a two-day retreat. Nhat Hanh continues to live in Plum Village in the meditation community he founded in France, where he teaches, writes, and gardens; and he leads retreats worldwide on "the art of mindful living." Lilian W. Y. Cheung, D.Sc., R.D. Dr. Cheung is a Lecturer, Director of Health Promotion & Communication, and Editorial Director of The Nutrition Source website (www.thenutritionsource.org) at the Harvard School of Public Health’s Department of Nutrition. Her work focuses on translating nutrition science into multimedia resources and community programs that help children, adults, and families lead healthier lives. She has extensive experience working with the mass media to promote healthy lifestyles that prevent major chronic diseases, such as heart disease, cancer, and diabetes. As the Director of Nutrition and Fitness at Harvard School of Public Health’s Center for Health Communication, she spearheaded a collaboration with Nickelodeon Television to embed nutrition and fitness messages into the network’s prime-time programming from 1991 to 1996. To improve the quality of nutrition information for the public, she co-moderated with Jane Brody, New York Times health columnist, a series of forums for health editors of family and women’s magazines as well as broadcast and news executives from 1985 to 1992. Later, her research resulted in a successful school-based nutrition and physical activity program for upper elementary school children, Eat Well & Keep Moving,(www.eatwellandkeepmoving.org), that has reached across the U.S. and 18 countries. Together with the late former U.S. Surgeon General Dr. Julius Richmond, she co-hosted one of the earliest national conferences to address childhood obesity, and co-edited Child Health, Nutrition and Physical Activity(Human Kinetics,1995). She also teamed up with a well-known children’s writer, Mavis Jukes, to create a book for adolescent girls, Be Healthy! It’s A Girl Thing: Food, Fitness and Feeling Great! (Crown/Random House, 2003). 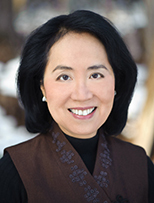 Dr. Cheung has been a student of Thich Nhat Hanh for more than a decade. She leads meditation groups and has helped establish ongoing mindfulness meditation sessions offered to all students, faculty and staff at the Harvard School of Public Health.